The death of ‘Iron Lady’ Margaret Thatcher has deprived UFOlogists of an answer to an enduring question: what did she really know about Britain’s Roswell incident? Thatcher, who died on 8 April aged 87, was 19 months into her first term as Prime Minister in 1980 when US airmen at the nuclear-armed twin airbase RAF Bentwaters-Woodbridge reported ‘unexplained lights’ (UFOs) hovering above Rendlesham Forest in Suffolk. The ‘Rendlesham Forest’ incident happened at the height of the Cold War when tensions in Poland – then behind the Iron Curtain -were reaching crisis point. In the years that followed, the Ministry of Defence drew up secret plans to base US cruise missiles at RAF Greenham Common and US airbases in eastern England and was keen to avoid drawing attention to a persistent story about a UFO landing near one of them. MoD always claimed the UFO incident was ‘of no defence significance’ but until I obtained a copy of their closed file on the case in 2001 – using a precursor to the Freedom of Information Act – the results of their inquiries into the strange sightings remained shrouded in secrecy. But before these plain facts entered the public domain UFOlogist and internet gossip columnist Georgina Bruni revealed that she had quizzed Thatcher face-to-face about her knowledge of UFOs and Rendlesham. The bizarre conversation took place in London at a charity cocktail party during 1997, shortly after the former Prime Minister had returned from an engagement in Washington DC. At the time Bruni was working on a book that she hoped would expose ‘the truth’ about Britain’s Roswell. “You must get your facts right,” she answered. That was the end of the conversation. Bruni – who died in 2008 – shook Thatcher’s hand, thanked her and the Prime Minister was escorted out of the room, followed by her bodyguards. Bruni was so impressed by this ‘admission’ that she used the phrase You Can’t Tell the People, despite its ambiguous status, as the title of her 2000 book that publishers Macmillan promoted as ‘the definitive account of the Rendlesham Forest incident’. 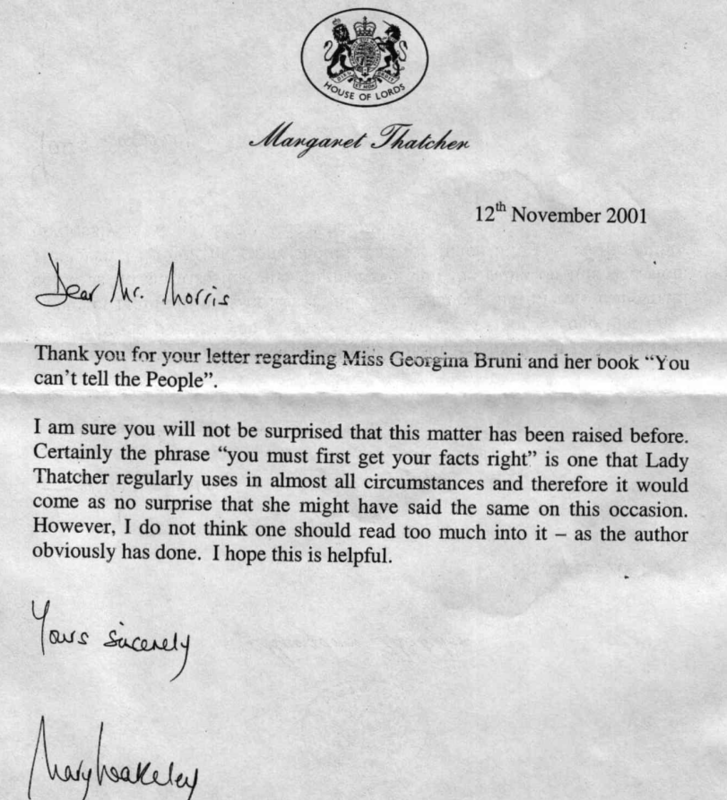 Several attempts were made to obtain an explanation of the phrase ‘you can’t tell the people’ from Baroness Thatcher’s office, without success. But a persistent UFOlogist, the late Eric Morris, extracted one plausible explanation from the former PM’s personal assistant Mary Wakeley. Although this anecdote appears to have impressed Bruni’s publishers, like many UFO-related yarns, it does not stand up to critical scrutiny. It could, for instance, be argued the ‘facts’ referred to by Thatcher were those contained in the MoD’s policy assessment – used to justify the closure of their UFO desk in 2009 – that UFOs as alien craft did not exist but those who believed in them would never accept that disappointing conclusion. So this was more a case of ‘don’t let the facts get in the way of a good story’ rather than a clue to the puzzle of Britain’s Roswell incident. Postcript: A number of readers have asked for my opinion of Georgina Bruni’s reliability as an investigator of the Rendlesham incident. Interested visitors should read my August 2009 blogpost, ‘Why Can’t You Tell the People?‘ for background information. This entry was posted in Uncategorized and tagged Britain's Roswell, Eric Morris, Freedom of Information Act, Georgina Bruni, Greenham Common, Margaret Thatcher, Ministry of Defence, no defence significance, nuclear weapons, RAF Bentwaters-Woodbridge, Rendlesham forest incident, Rendlesham forest UFOs, UFOs, Winston Churchill, You Can't Tell the People. Bookmark the permalink. Ronald Reagan and Margaret Thatcher…Ugh. I can’t look at their faces without puking. You prefer Chavez and Stalin? Intelligence officer Lt Col P J Corso advised USA President Ronald Reagan about aliens (people not from this Earth). Everything Ronald Reagan knew and said about aliens came from Corso and Corso’s friend and chief general Trudeau. That’s funny, I feel that way about the joke we have in the White House now. I totally agree. Not only repulsive looking, but repulsive human beings. Do you believe it or are you just repeating what you’ve been told? It’s real.. there’s more than 4 type of alients apearing around planet earth and they have huge base on moon,, the moon is death star alike planet, planet earth is their genetic farm, also experiment research lab, also the raw material mining place, they creat human by mixing their gens and some animal already exist on planet earth, God created human beings in his own image – so we do looks like little grey isn’t it? and U.S gold reserve vault is empty base on Sumerian ancient texts suggest, annunaki creat human mining gold, isn’t it? that’s why she said “You must get your facts right,” “You must have the facts and you can’t tell the people.” people your alients slave isn’t it? But forgive me for being rude David but for a teacher of journalism it always amazes me how easily and readily you defer to the opinion of the authorities. You seem to think the MOD’s response ‘it was highly unlikely that any violation of UK airspace would be heralded by such a display of lights…[we] think it equally likely that any [Soviet] reconnaissance or spying activity would be announced in this way‘ was the only possible conclusion anyone anywhere could ever’ve come to. But imagine this scenario you’ve called the police in the middle of the night because you’ve noticed a protracted period of furtive movements round your house in the form of oddly coloured flashes of what might’ve been someone shining a multi coloured kid’s toy raygun through your own kids’ bedroom windows. If the person at the other end of the line now said “Sir I find it highly unlikely a burglar’d herald a break in of your premises with such a silly and ostentatious display of lights and I think it equally unlikely the predatory paedophiles down the road’d announce they were spying on your kids in such an obvious and pronounced way” would you really respond “Now you’ve entered these plain facts into the public domain officer I’ll be troubling you no more”? >In Georgina Bruni’s defence there’s a world of difference between the printed word and the enormous range of >nuances of meaning that can be crammed into a spoken comment. Yes particularly if you’re wanting to spin an off-the-cuff comment for self-promotional purposes! >But forgive me for being rude David but for a teacher of journalism it always amazes me how easily and readily >you defer to the opinion of the authorities. But sometimes Alan – and I know this is a shocking thing to say – the authorities might actually be telling the truth. If that truth is something that people do not want to believe (i.e. there are no aliens) then people like Georgina might actually be deluded or, heaven forbid, lying. I know from personal experience that Georgina lied deliberately. She claimed, for example, that Lord Hill-Norton was responsible for obtaining the release of the file on the Rendlesham incident. When I pointed out to her this was incorrect she – in printed word – called me a chancer who was trying to ‘jump on the bandwagon.’ The files released by the Ministry of Defence prove beyond any doubt that she was lying and I was telling the truth. You can even see the fax she wrote begging the MoD to send her a copy of the file after it was released to me. So please excuse me if I do not believe a word Bruni wrote or said. She liked to call herself a journalist but she was in fact a plagiarist who continued to lie about the work done to release the file after the evidence was presented to her proving otherwise. >You seem to think the MOD’s response ‘it was highly unlikely that any violation of UK airspace would be heralded >by such a display of lights…[we] think it equally likely that any [Soviet] reconnaissance or spying activity >would be announced in this way‘ was the only possible conclusion anyone anywhere could ever’ve come to. No I don’t. Where do I say that this was the ‘only possible conclusion’? Like it or not, this was the MoD’s conclusion, and it is the job of the journalist to report what the official conclusion was. You’re mixing up reportage with personal opinion. >But imagine this scenario you’ve called the police in the middle of the night because you’ve noticed a >protracted period of furtive movements round your house in the form of oddly coloured flashes of what might’ve >been someone shining a multi coloured kid’s toy raygun through your own kids’ bedroom windows. If the person at >the other end of the line now said “Sir I find it highly unlikely a burglar’d herald a break in of your premises >with such a silly and ostentatious display of lights and I think it equally unlikely the predatory paedophiles >down the road’d announce they were spying on your kids in such an obvious and pronounced way” would you really >respond “Now you’ve entered these plain facts into the public domain officer I’ll be troubling you no more”? The difference is that we know that burglars exist because the police, when they do turn out, often catch them. Therefore they can argue that it is worth spending public money to respond to calls about burglars. When was the last time the police were called out to a report of a UFO and captured one? Yet in this case, Alan, we know for a fact that no one did turn out. Even Charles Halt failed to persuade the RAF to take his story seriously (nothing on radar). He called his own boss, Col Conrad, who turned out of his house to look for the UFOs but couldn’t see a damn thing. So what did Charles Halt do? By his own account – and this is documented on his tape – he turned around and went home to bed. Think about that. Aliens are landing next to a nuclear-armed front line NATO airbase and what does the deputy base commander do? He dosen’t press the panic button and scramble aircraft, because he knows if he does so and it turns out to be something and nothing he would be toast. Nope, he goes back to bed. Perhaps Ross is looking into a mirror. Reagon and Thather where two of the worlds greatest leaders. They were so great you didn’t bother to learn how to spell EITHER ONE of their names. I’m with Ross. The pain those two caused is still reverberating today. I think it’s all about context and motivations. If we imagine, for a moment, that Thatcher somehow knew that ‘Folk from Elsewhere’ were visiting Earth; would it be reasonable to imagine she’d confirm ‘the big secret’ to a stranger at a party? Moreover, where are the supporting examples of similar gross lapses of judgements relating to her indiscretions and terrible secret-keeping? Regardless of the beliefs or perspectives of Thatcher and Bruni, It doesn’t make contextual sense and there was no apparent motivation to imply such a secret to someone unknown. That doesn’t mean I have to doubt the veracity of Bruni’s recollection – she may well have been completely accurate. However, it’s fair to say that ‘You can’t tell the people’ could mean anything. Thanks kandinsky, you’re absolutely right. Perhaps ‘Thatch’ was just being mischievous or didn’t actually hear or understand fully what was being said, we don’t know how noisy the soiree was, or how drunk ‘Thatch’ was. As for her oft used phrase “You must get your facts right,”, sounds like a phrase she just used to cover disinterest or lack of knowledge. I knew a chap some years ago who always said ‘It is what it is.”, it was his response to almost anything that was vague, it seemed to be just a ‘tool’, a shield to hide his ignorance or indifference behind. Likewise I can see ‘You can’t tell the people’ as just a response sound-bite, very ambiguous and the person receiving it does all the work, if their imagination believes in gnomes, aliens or unicorns, then that’s what they perceive her response was alluding to. As for the event itself, I think that Dr Clarke said it all in his response above, that Halt just went to bed. The events obviously weren’t that important to him that night. I’m sceptical and certainly have read or seen nothing that would indicate the reality of aliens visiting Earth, yet if I had experienced something that these guys ‘believed’ they had, then I probably wouldn’t be sleeping until the nervous breakdown from the overwork I would be putting in to prove or explain what had happened. You can’t win with these alien visitation believers, first they believe that there is a global conspiracy amongst ALL world governments to cover up the existence of alien piloted UFOs, this in a world where, in the whole of recorded history, humans have never had consensus about anything. Then when the governments release the goods on what they do have, and it doesn’t support their belief, they ignore what is before them and claim another conspiracy !! We are now living on a planet of over 7 billion people, and there must be over a billion to two billion of them that are carrying a camera or camera phone most of the day, yet all we get are fuzzy blobs and Chinese lanterns. For a few generations now billions of people have had more chance than ever before in history of encountering aliens or time-travelling humans, and still we have as much evidence as we have for unicorns, the Loch Ness monster and an honest politician!!! What puzzles me is that we live in an information age, and the preponderance of evidence is that aliens have not visited Earth, ever. Yet the hyper-sceptical, bogeyman under the bed conspiracy people, still cherry pick the chaff instead of the wheat, and bake a loaf of complete unreality. It’s strange how folks believing in one conspiracy, also believe in most of the others, must be the mindset. There is another possibility, which is that aliens exist and like to to make fools of us. They tell us they will give us their wonderful technology, never do it, and fall about laughing. You must have read The Trojan Horse by John Keel in which ‘aliens’ do this all the time. 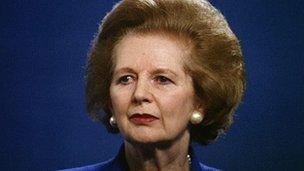 I have a nasty feeling that Thatcher was one of their great successes. She went so far as to destroy nearly a quarter of British industry in the belief, perhaps, that this was necessary before the world could transition to new alien-inspired technology. I am no fan of Thatcher, I lived in a naval town when she was closing it down, we were pretty sure that had the Argentinians waited a year, we would have had no naval capacity left to raise a task-force, and her belief was that the UK could just be a service economy, someone somewhere has to be making something, we can’t all be bankers, shop-assistants, road-sweepers and waiters. I see Fuhrer CaMORON has been saying lately that he wants to ‘re industrialise’ the UK, I think it too late now, Thatcher saw to that. Sorry, John Keel’s book is called Operation Trojan Horse. Charles Halt went back to bed ….. simply because he was too pragmatic to do otherwise. I mean …. in the face of that high level of [UFO/alien] technology — exactly WHAT are one’s options?? Halt followed U.S. military protocol. He immediately told his superior officer. At that point ….. it’s up to his boss [Conrad] to take any necessary action(s). And as I understand it ….. the information was, indeed, conveyed up the chain of command ….. to Reagan and to Thatcher. And having reached the U.S. President / Commander-In-Chief and the British Prime Minister at that point ….. what exactly would you propose THEY could actually DO? Seriously! Er, just hold the bus a moment: ‘as I understand it…the information was, indeed, conveyed up the chain of command…to Reagan and to Thatcher’. The source of this information is what precisely? Where is the evidence that Reagan or Thatcher were told? Halt waited two weeks, for the RAF Base Commander to return from his Christmas holidays, to inform his British hosts. That in itself shows the low level of priority he gave it at the time. The letter’s a fake. It is grammatically wrong; I’d be very surprised if this had come via Lady Thatcher’s office. Being ‘very surprised’ isn’t the same as providing proof Heather. Grammatical errors do not prove it is a fake. If you have any actual evidence I’d love to see it.